First off, I would like some of your thoughts on this project. I have this Australian fabric that I bought at Quilt Market, just because I knew I would never see it again. When I got home, I had these batik 2″ squares already cut out from a project a long time ago that needed something completely different. They had become very forgotten and lonely over the years. 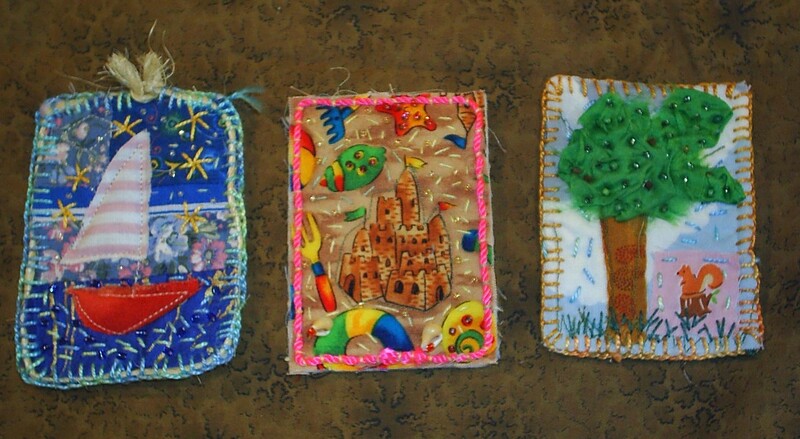 So decided to start making these 4-patches with some of the Australian fabrics to use them up. Now I want to put these 4 pacthes together, and I can’t decide on the center setting squares. I have pretty much decided on the green woven for the outside setting triangles. But what do I do about the middle? Please comment and help me figure out A, B, C, D, E, or F……What do you think? And now the goodbyes….ha, I hope you didn’t think I was leaving…You can’t get rid of me that easily. These are the leaving parties. And these are going to Judiwhom I met thru bloggin’. 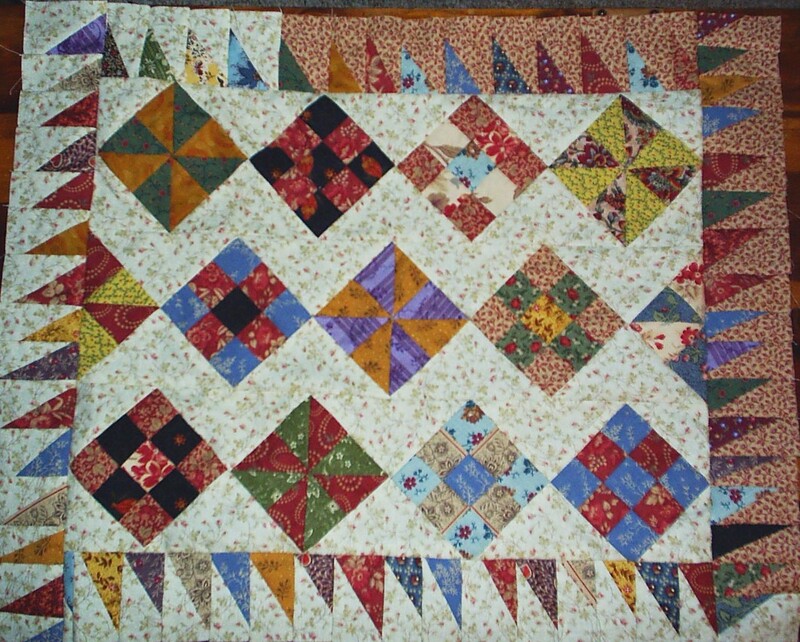 And last but not least, here is my finished TOP for the doll quilt swap….so it isn’t leaving yet, but it will be soon. I have to quilt and bind it, and whip up a few little goodie extras to go with it. I have a ton more to post, but I really want to get back to the studio. Please let me know which fabric you think I should put in the center squares of my table-runner, and if you haven’t done so already sign up by commenting on post 101 for a free fabric giveaway. ‘too busy’ and I think your 4 patches would get lost with them. Go with what draws you!! I’d choose “A”. It looks like it would provide good contrast, and it has some green in it to go with the border. I love fabric C–I am drawn to the pinks and reds in the blocks and I think the deeper color in C would set off the blocks. Is your piece going to stay table runner size? 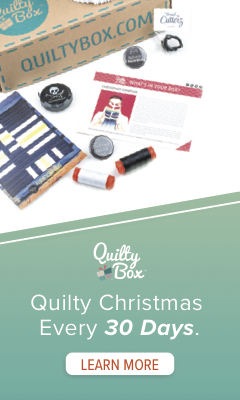 ‘Cause you could easily turn all those luscious fabrics into a larger quilt by shading your colors from the reds, through the brighter yellow to the browns and greens. Or set the 4 patches edge-to-edge and surround with fabric borders……I know –you just wanted comments on the single idea you were working on! So, I love fabric C! I’d think A or E for the lighter contrast. You’ll have to decide if they are both too busy once you get them on the wall. Ok i might go out on a limb here and choose C or E. You will know the minute you place the 4 patches up around them. if the 4 patches disappear don’t use that fabric. it doesn’t have to be a light or a dark for my tastes but its the constrasts and if it wahes the look out. 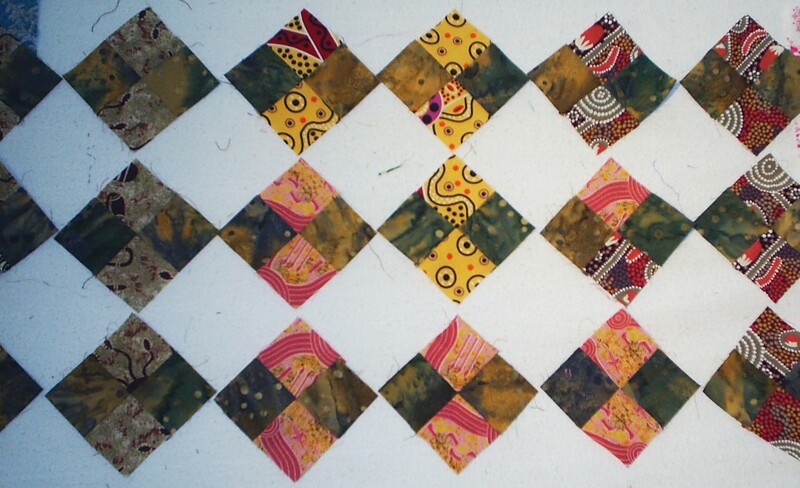 i have seen quilts with the right amount of values however the effect seems washed to me because of placement issues. ie..you can’t see the stars for the lights around it. Oh brother i need coffee! i use handdyes and batiks alot so i look at it all slightly differently! Why not use square-in-a-square as setting blocks? You could use 2 OR 3 OR 4 OR even as many as 5 fabrics (if you want to make it really scrappy). 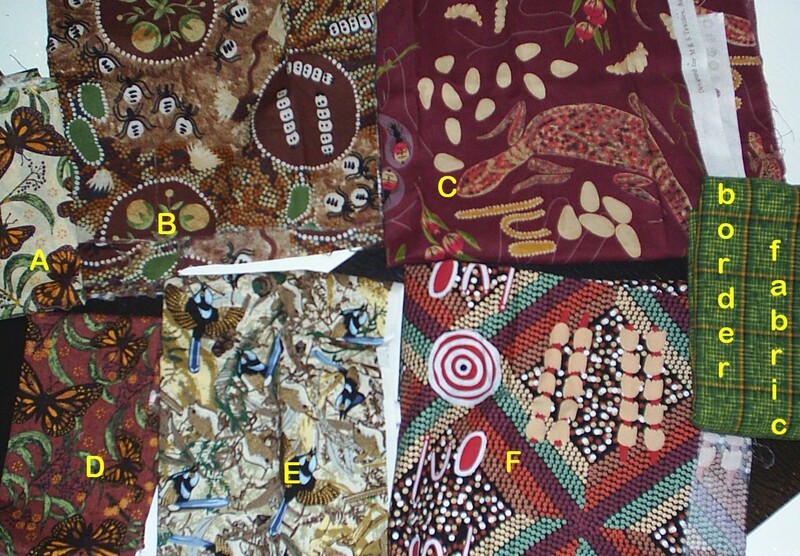 Love those Aussie fabrics. The real ones. Great stories, terrific visuals, and the colors are nothing if not subtle. Oh, I do like that idea of square in a square…I hadn’t thought of that! NICE!…Thanks a bunch! Check back later to see if I go with that idea! go with E! You need something light! I like B or C for a dark contrast to the blocks, A for a light contrast. Try laying a few of them out on top of the different fabrics. I would use “C” if I was looking for drama & “E” if looking for fresh and light. But that’s just me. Another Pickle. I am going for E, it is a little quieter, and more suttle. It might bring the colours togehter.